Comprehensive software development for embedded software, infotainment, connected cars, automated driving, and more. With the increasing consumer demand for the latest in-car infotainment systems, and driver assistance technologies, something more than the traditional approach to software development is needed. 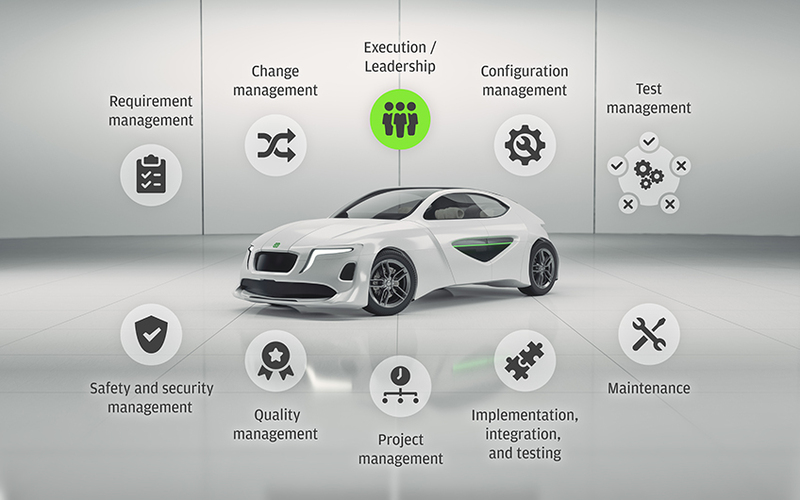 EB has 30 years of experience in the automotive environment, and also has the expertise and partnerships needed to bring lean and agile principles to software development and industrialization. We can help you keep pace with the fast-moving developments. Furthermore, the close collaboration with our extensive partner network enables us to develop premium solutions to meet your specific needs. All our business models ensure transparency and trust, thus creating confidence in the services we offer. We use a Lean Development Model specifically tailored to automotive software development that combines agile methods with the principles of KISS (keep it simple, stupid) and Clean Code. Our global presence means that we can manage large and complex software projects that involve multiple sites, sub-suppliers, and partners on a worldwide scale. This also means that we have technology competence and expertise in all relevant platforms, such as QNX, Android, and Linux/GENIVI. Our dedicated software integration processes have resulted in proven experience in automotive integration. We have a solid track record with leading car makers like BMW, Audi, and Ford, just to name a few. Tailor-made, automotive-grade software for ADAS and automated driving.